P.Krishnaswamy and V.Mahadevan Udappu group Corr. 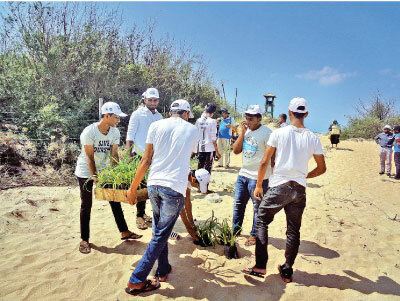 The Bio Conservation Society (BCSL) implemented the Biodiversity Conservation and Beach Vegetation Re-plantation Program with the financial assistance of People’s Leasing & Finance PLC as one of the flagship corporate social responsibility initiatives with 10 PLC branches (Mannar- Erukkalampiddy, Puttalam - Kandakuliya, Chilaw - Karukupone, Negombo - Dungalpitiya, Panadura - Pothupitiya, Aluthgama- Athuruwella, Ambalangoda- Ahungalla, Galle - Mahamodara, Matara- Midigama and Tangalle- Kapuhenwala). One of these programs was recently implemented in Kalpitiya in Puttlam district from March 08 – 28. About 4,500 Pandanus tectorius (screwpine - Wetakeiya in Sinhala ) saplins were planted on the beach at nine of the above sites, except Mannar. 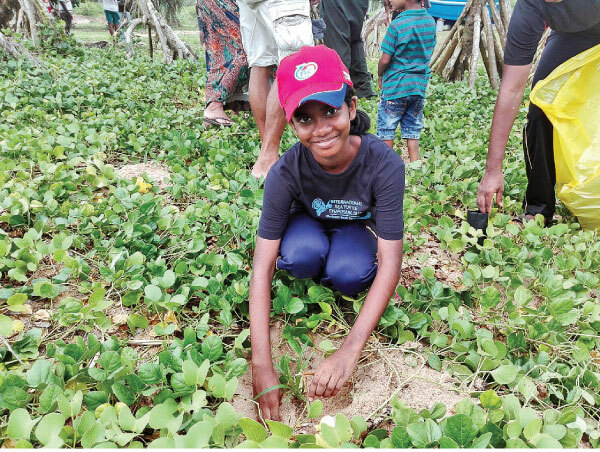 About 1,000 Mangroves (Rhizophora) were planted at Erukkalampiddy, Mannar on 28th March. The programme was conducted with the permission and support of the Coast Conservation Department (CCD). Moreover, 10 awareness workshops were conducted to highlight the importance of sea turtle and coastal biodiversity conservation. Certificates were issued to the participants at the workshops and at the replanting programs as a motivational initiative on bio-diversity conservation activities. A colourful poster on coastal biodiversity conservation was distributed among the participants. The Department of Wildlife Conservation, the Sri Lanka Police, the Sri Lanka Coast Guard, Government schools and community members, supported the implementation of the program. Planting was done through Shramadana campaigns with the support of local communities and all the above stakeholders. Responsibility on the upkeep of the plants were entrusted to the members of local communities who are living adjacent to the planting sites. It is projected that under this program, coastal erosion will be prevented, while conservation of coastal and lagoon ecosystem will be promoted. Also, global warming will be addressed to a considerable extent through reforestation programs. The People’s Leasing & Finance PLC which mainly in the business of leasing vehicles, proposes to introduce alternative methods to reduce CO2 emissions (carbon dioxide sequestration) leased from ten of the People’s Leasing and Finance branches by increasing mangrove and Pandanus vegetation coverage.